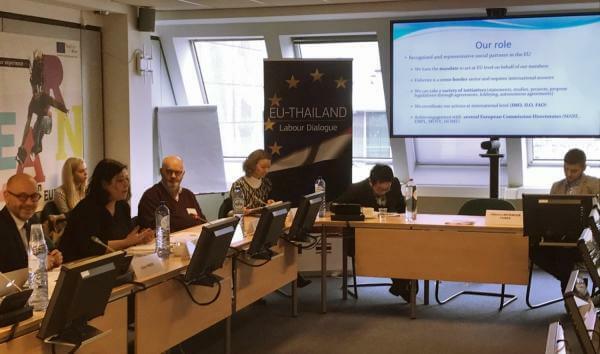 ETF met today with a high-level delegation of the government of Thailand, who were visiting Brussels to discuss labour issues. Livia Spera, ETF political secretary for Dockers and Fishers, gave a presentation with Europeche, the employers’ association for the fishery sector and ETF’s social dialogue partner for fisheries. The presentation focused on the role of EU social partners in framing working conditions in fishing, and how they work to prevent severe labour abuses in the EU. The presentation stressed the need for a supportive regulatory framework for social dialogue and freedom of association. The Thai delegation showed great interest in the issues, especially the ways that unions in Europe attempt to organise migrant fishermen and integrate them into their campaigns.